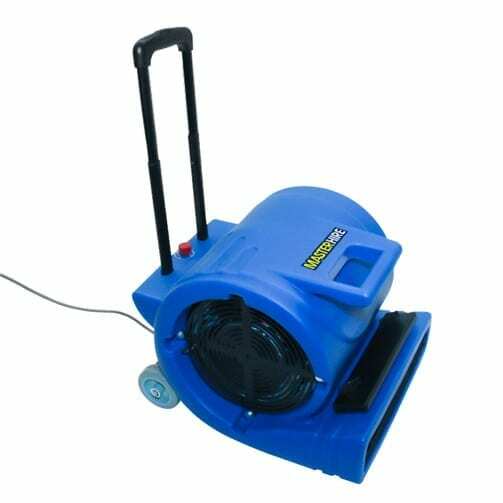 Master Hire’s carpet dryers are a 240v high powered fan used to direct large volumes of air toward and underneath carpets. They can also be used to dry out other floor surfaces, walls and even ceilings. For best results, use these units in combination with a dehumidifier to remove as much moisture as possible. Even the slightest bit of moisture will encourage the growth of mould and mildew in the room. If your carpet is damp, but not soaking wet, you should use one or more carpet dryers to blow air across the surface of the carpet. For carpet that is soaked and bubbles up when stepped on, you will need to peel back a corner of the carpet and position the carpet dryers in a way that it begins to blow underneath the carpet (this will help your dryer evaporate the water from underneath your carpet). When you separate the carpet from the padding (insulation), it will allow more air to flow directly over the affected areas and cause them to dry quicker. You will need to leave the carpet dryers on for a number of hours or even days to get the carpet completely dry. See also: Carpet Cleaners, Wet and Dry Vacuum Cleaners, Fans. SKU: CARPETD. Category: Cleaning Equipment. Tags: Fans, Flood Cleaning Equipment, Industrial Fans.